It was a capacity audience in Woodbridge Library this evening, and there was great excitement and anticipation at meeting Joanne Harris, the author of 'Chocolat', and many other novels, short stories and cookbooks. 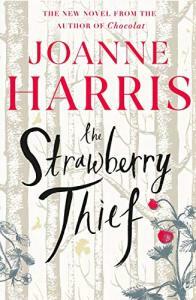 Joanne joined us the day after the official publication of her novel 'The Strawberry Thief'. This new book continues the story of Vianne Rocher, first introduced to us in 'Chocolat'. Vianne and her younger daughter Rosette are happily running the chocolate shop in the square when life is disrupted by the death of the florist, Narcisse and a mysterious new shop opens in town. This is the fourth book to explore the life of Vianne, though Joanne was keen to stress it is not a further 'instalment' in the Chocolat series. Indeed there were many young faces in our audience who will be reading about the village of Lansquenet-sous-Tannes for the first time. But it is seven years since the last book 'Lollipop Shoes' was published, and shockingly 20 years since 'Chocolat' was released. Joanne told us that she was astonished at the success of that book because it was her third and she had been told it didn't have a market. Instead it was a huge bestseller and she found herself invited on to the red carpet of the movie premiere and at many grand occasions. She found that the enormity of her success caused her to faint at the most inopportune moments! Despite the tremendous response to the book, Joanne explained how she had never wanted to write sequels to the book, though her publishers may have wished her to do so. Instead she had to wait until her experiences of life, and particularly motherhood, were able to feed into her writing. Working from her garden shed in Barnsley, Joanne says she begins the day by posting on Twitter and gets herself in the mood for each book with a playlist of music she has created for each title. She believes in the immersive experience of writing and reading, she says, and has carried out evenings where music and singing accompany storytelling. Touring the country for bookshops and festivals with this book, Joanne has been 'spritzing' audiences with a scent she has had specially created to reflect this book. You had to be there to experience it, of course. Tickets were £20 including a copy of 'The Strawberry Thief' (RRP£20). One additional ticket could be purchased for £12 without the book.